Crime dramas tend to involve several potential suspects. Some suspects have a good motive to commit the crime but also a good alibi. Viewers presented with the exact same details can develop different theories about the culprit, and at some point one onlooker might blurt out “who done it” while another says, “Don’t tell me!” Often the climax arrives when a brilliant detective or defense attorney not only proves why their client didn’t commit the crime but why another person—usually seated in the room for dramatic effect—was the real culprit. It isn’t enough to prove who didn’t do it; viewers want to know what actually happened. Image credit: Copyright © K. Jorgen. Used in accordance with federal copyright (fair use doctrine) law. Usage by ICR does not imply endorsement of copyright holder. A potential explanation is blind chance or luck. But the preferential sorting of organisms with certain traits that match changed conditions is often predictable.1 This fact, coupled with evidence from population statistics,2 indicates that chance is an unlikely explanation for most sorting events. Physicists could provide another explanation. Some might claim that physical forces can cause sorting similar to the way dynamic fluid environments use phenomena like momentum and drag to sort suspended particles with different traits into different zones. But physics alone doesn’t seem enough for the preferential sorting of creatures. A theologian might say God selects each organism to live at a particular time and environment of His choosing in order to accomplish a specific purpose. Scientists who believe in the sovereignty of God and His active involvement with His creation could readily agree with this. But they would be hard-pressed to devise a scientific test or device that measures God’s activity. Nevertheless, the theological explanation makes intuitive sense since it explains preferential sorting by the means familiar to everyone—an intelligent agent. Not surprisingly, even those who promote evolution or intelligent design use some manifestation of volition to explain preferential sorting. For example, when a fish with normal eyes is observed living in an open stream but its blind cousin resides in a cave, the question arises: Did a volition-based selection preferentially sort out these fish to the appropriate environment? ICR’s article series Darwin’s Sacred Imposter covered a few reasons why we should reject attributing volition to nature. But first, let’s consider a more precise way to express how certain traits may be truly selected to fit specific environments. ICR’s continuous environmental tracking model...lifts evolution’s mystical mists by explaining adaptation in terms of engineering principles. 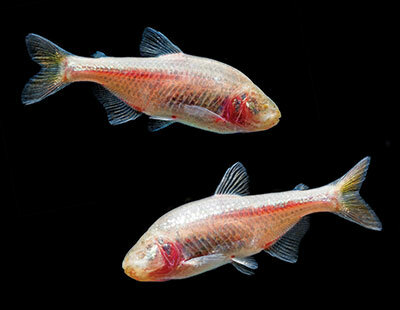 Two blind cave fish—Mexican tetra—native to Texas and Mexico. The most recent articles in the Engineered Adaptability series described an indispensable element of tracking systems (together with sensors), which is logic mechanisms.4 We found that an organism’s programmed “if-then” logic enables an internal selection of the correct solutions to different challenges. When specific conditions are detected, the adaptive response is a particular and necessary consequence of these complicated, logic-based systems. There appears to be a link to real volition. An organism’s logical programming carries out the conscious logical intentions of an intelligent agent—the organism’s programmer. Thus, what we observe in nature are biased responses that result in the preferential sorting of creatures with different traits that fit different environments. From an engineering standpoint, if organisms are going to live in ever-changing environments, they need an adaptable design. Creatures use an array of mechanisms to continuously track environmental changes. One fascinating aspect of innate self-adjusting mechanisms appears to be a programmed “strategy” for adaptation that corresponds in function to programs that human engineers produce. This aspect could be described as immanent selection.5 Immanent refers to something inherently within—i.e., built in. So, immanent selection is a type of internal selection. If it is the outworking of a strategy, how does it work? Engineers try to anticipate every challenge their designed entity will encounter so they can engineer specified solutions that precede the challenge. The predictive plan that engineers develop is called an adaptive strategy. The inherent selectivity of “if-then” logic mechanisms is integral to implementing a strategy. When engineers write specifications, they select one component or process over another. Thus, specificity is linked to an intelligence-based selectivity. Immanent selection seems like a fitting collective depiction of precise selective characteristics and adaptive responses of both cells and organisms…characteristics and responses that can be traced back to identifiable internal information. As noted earlier, an internal selective activity happens that shuts down eye development in certain fish embryos—but enhances development of other senses—so that these fish can pioneer into caves. In other words, creatures are active, problem-solving entities that take on environmental challenges and continuously fill different niches. But as we saw in a previous article in this series, Darwin revolutionized how biology views organisms by mischaracterizing them as “passive modeling clay” that is shaped by nature over long periods of time.10 Intelligent design advocate William Dembski explains how Darwin illegitimately projected selective capacity onto nature and deflected it from the designed specificity within organisms. Engineers neither project non-quantifiable powers onto nature, nor do they assert that a problem can somehow “select” its solution. Engineers recognize that solutions either solve a problem or they don’t. In fact, projection of power onto a statue, a rabbit’s foot, or even nature is a spiritual issue. ICR’s continuous environmental tracking (CET) model, currently in development, lifts evolution’s mystical mists by explaining adaptation in terms of engineering principles. Since engineering causality exposes the mysticism of belief in “selection events” or “nature exercises agency,” it reveals what doesn’t happen. But even more than that, CET hypothesizes what does happen. It predicts that organisms track environmental changes using elements that correspond to those found in human tracking systems. Research shows that creatures not only have such elements, they do, in fact, use them to track changing conditions. CET expects a type of immanent selection through the selective nature of “if-then” logic—an internal selection during development (and afterward) of pathways that express traits suitable to specific conditions. Organisms are not passive modeling clay. Therefore, organisms are not passive modeling clay. They are instead active, problem-solving entities that solve challenges and fill new niches…just as the Lord Jesus designed and purposed them to do. Guliuzza, R. J. 2018. Engineered Adaptability: Adaptive Changes Are Purposeful, Not Random. Acts & Facts. 47 (6): 17-19. Thomas, B. New Genomes Project Data Indicate a Young Human Race. 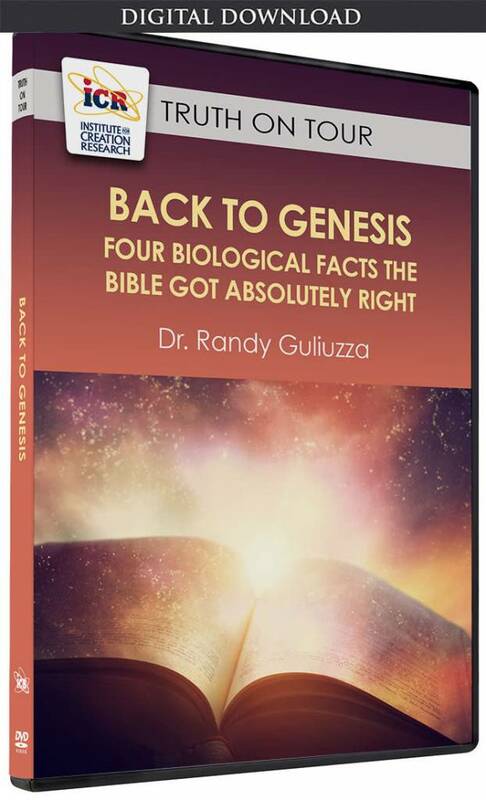 Creation Science Update. Posted on ICR.org November 9, 2010, accessed December 4, 2018. Tomkins, J. P. Blind Cavefish Illuminate Divine Engineering. Creation Science Update. Posted on ICR.org October 23, 2017, accessed November 27, 2018. Guliuzza, R. J. 2018. 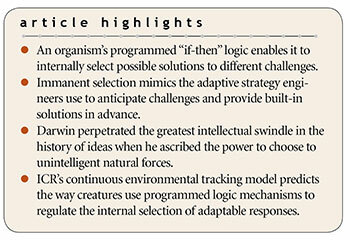 Engineered Adaptability: Logic Mechanisms Direct Creatures’ Innate Adaptability. Acts & Facts. 47 (11): 17-18; Guliuzza, R. J. 2019. Engineered Adaptability: Biological Networks Feature Finest Engineering Principles. Acts & Facts. 48 (1): 17-19. Phil Gaskill, coauthor of the research paper about continuous environmental tracking presented to the 2018 ICC, crafted the descriptor “immanent selection.” See Guliuzza, R. J. and P. B. Gaskill. 2018. Continuous environmental tracking: An engineering framework to understand adaptation and diversification. In Proceedings of the Eighth International Conference on Creationism. J. H. Whitmore, ed. Pittsburgh, PA: Creation Science Fellowship, 158-184. Hazard, L. C. 2004. Sodium and Potassium Secretion by Iguana Salt Glands: Acclimation or Adaptation? 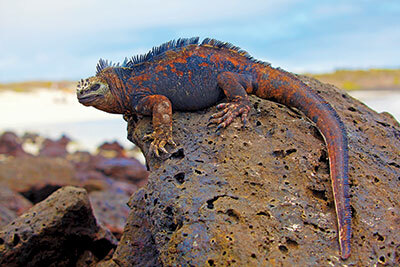 In Iguanas: Biology and Conservation. A. C. Alberts et al, eds. Berkeley, CA: University of California Press, 84-93. Membrane Channels Show Astonishing Specificity. Evolution News & Science Today. Posted on evolutionnews.org August 30, 2018, accessed 28 November 2018. Coppedge, D. F. Be Thankful for Skin. Creation Evolution Headlines. Posted on crev.info November 23, 2018, accessed November 27, 2018. Crabtree, M. and T. Nott. These Organelles Have No Membranes. The Scientist. Posted on the-scientist.com December 1, 2018, accessed December 1, 2018. Guliuzza, R. J. 2017. Engineered Adaptability: Adaptability via Nature or Design? What Evolutionists Say. Acts & Facts. 46 (9): 17-19. Dembski, W. A. 2004. 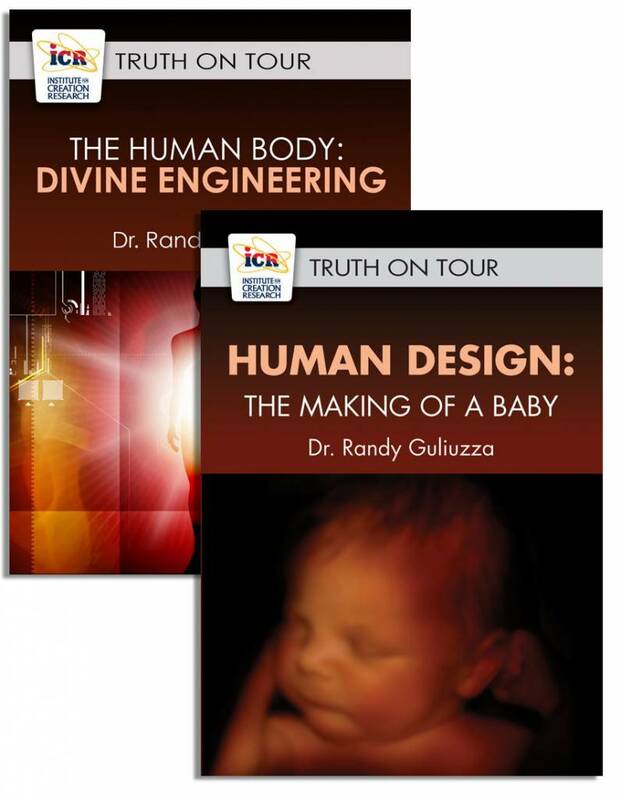 The Design Revolution: Answering the Toughest Questions about Intelligent Design. 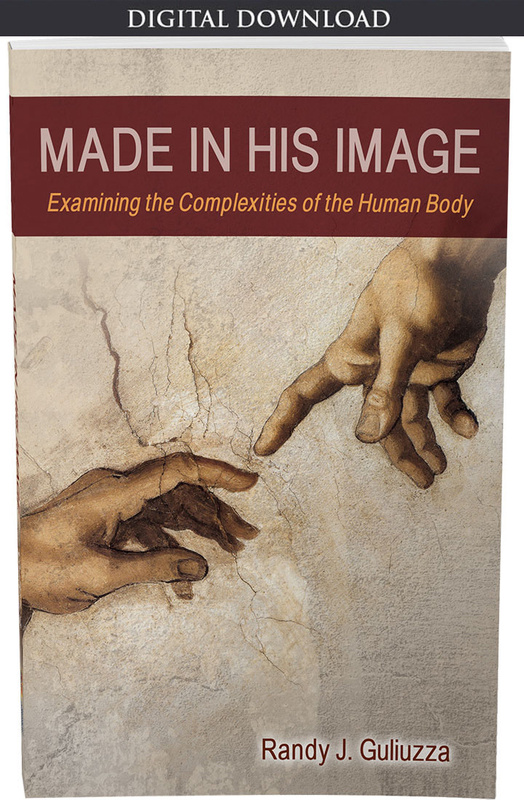 Downers Grove, IL: InterVarsity Press, 263. Emphasis in original. Hodge, M. J. S. 1992. Natural Selection: Historical Perspectives. In Keywords in Evolutionary Biology. Cambridge, MA: Harvard University Press, 213. Huxley, T. H. 1894. Darwiniana. New York: D. Appleton and Company, 65. Talbott, S. L. Can Darwinian Evolutionary Theory Be Taken Seriously? The Nature Institute. Posted on natureinstitute.org May 17, 2016, accessed September 14, 2018. Emphasis in original. Cite this article: Randy J. Guliuzza, P.E., M.D. 2019. Engineered Adaptability: Trait Selection Is Internal, Not External. Acts & Facts. 48 (2).